Brown Out: Copper Canyon’s burgers and chops are “well-done”—and too little else is. The restaurant space in the Radisson hotel (formerly the Doubletree, Hilton, etc.) on South Temple has been home to so many different eateries, I’ve lost track of some of them. Most recently, Shula’s and High Rock Steakhouse came and went. 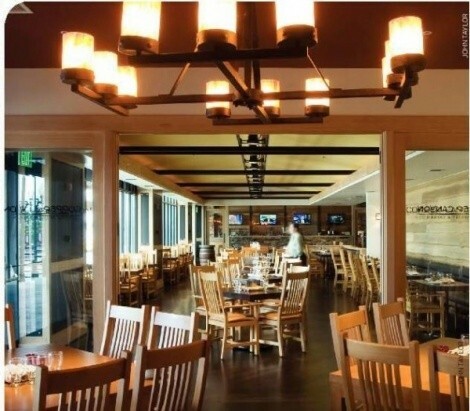 Now, there’s another gleaming new restaurant in that location: Copper Canyon Grill House & Tavern. Visually, Copper Canyon is a big improvement over its predecessors. Most impressive is the huge, square metal and glass front door, which rotates on a central pivot to open and close. It looks like something designed at MIT that should be on display at the Museum of Modern Art. Once inside, you’ll find the restaurant to be sleek and contemporary: a long, rectangular space with a glassed-in private club at one end and a private dining room at the other. The place is so new and clean you could eat off the floors. Unfortunately, the color palette is a tad monotonous. Virtually everything at Copper Canyon—from stone walls to wood walls to the tables and chairs and floor—is either tan or brown or some variation of tan or brown. A splash of color here and there would be welcomed—flowers on the tables, perhaps? During my three visits, Copper Canyon was virtually empty, making it feel like less of a “house” or “tavern” and more like a high-rent morgue. But even without a press of customers, service there is consistently lackadaisical, only a small step up from what you’d expect at a fast-food joint. Make no mistake, though—a glance at the Copper Canyon prices quickly confirms that this is no budget eatery. Burgers priced at $11 and $16 pepper the lunch menu, along with a dinnertime rib eye priced at $34. Even an order of chicken wings is $10. Apparently, in Copper Canyon, the recession will not be televised. There also has to be a flavor-extraction machine in the kitchen. How else to explain the palate-numbing blandness of the vegan sauté ($15), which is a jumbosized bowl of bell peppers, yellow squash, broccoli, crimini mushrooms, almonds, canned Mandarin orange slices and a big hunk of flavorless seared tofu. The tofu never stood a chance; all of the sesame soy “jus” was pooled at the bottom of the bowl. The chef might want to consider putting the sauce on top of the food. A bone-in airline chicken breast ($19)—described as “free-range poulet rouge”—was more interesting, served with good parsnip- and carrot-spiked mashed potatoes and natural jus. Still, it didn’t really hit any high notes, nor did it seem worthy of the $19 price. Copper Canyon features an “After 5 slow-cooked meat & potatoes” special which is said to be “braised all day and priced to sell out.” Well, daylong braising didn’t prevent the bison shortribs ($18) from coming to our table lukewarm, barely. I’d ordered a Berkshire pork chop ($25) and thought it odd that our server didn’t ask how I wanted it cooked. (I would have requested medium-rare.) As we were attempting to finish a fairly dreadful appetizer trio of dried-out smoked Utah trout, Idaho sturgeon and Atlantic salmon ($14), the chef strolled by our table. So I asked her how she was cooking my pork chop. “Oh, people in Utah like their meat well-done,” she answered. “Not me,” I replied. When I told her I’d prefer my chop medium-rare, she said she’d pull it off the stove immediately. It came to our table—you guessed it—well-done. I would have complained to the chef or manager, but they were busy kibitzing with friends in a booth near the front door. You’d think they’d at least have chosen a table in the rear of the restaurant to loaf. I’d been told by a Copper Canyon server that the Niman Ranch Angus cheddar burger ($11) was better than their $16 American Kobe burger, which is advertised on the menu as the “Best Burger in SLC.” So I ordered the Niman Ranch burger and was asked how I’d like my burger cooked. “Medium-rare,” I said, hopefully. I think you know how this story ends: The burger came to me well-done. In the cook’s defense, I’ll admit that it would have been nearly impossible to cook the quarter-inch thick burger (the same thickness as the tomato slice that came with it) any way but well-done. I never thought I’d taste anything so unsatisfying with the name Niman Ranch on it, but someone in the kitchen desecrated my burger, just as the chef had killed my pork chop a couple of nights before. I will say this: The burger buns at Copper Canyon Grill House & Tavern are excellent. As I attempted, unsuccessfully, to gag down the remains of my murdered burger, the server asked, “Save room for dessert?” Strike three.